Those looking for a safe and affordable taxi in Belmont can count on us no matter the time of day or night. As an established company, we’re dedicated to providing the best service to all that choose to use us, whether you’re travelling to the airport or require a transport solution to get you around the town. We’re proud of our reputation as a private hire service that never fails to go above and beyond for the needs of our customers. We have an extensive, modern fleet of vehicles that are available 24-hours a day, 365 days a year. For that reason, we’re often the first choice for customers seeking a quick and reliable Belmont taxi. We work exclusively with a team of qualified and experienced drivers so you can trust that our services are second to none. Book with us now by calling 01372 722222 and speaking to a member of our friendly team. 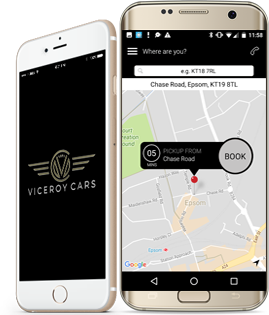 With our years of experience providing minicabs in Belmont, you can trust that we’re a company that will give you a service you won’t forget. With us, you’ll get a lot more than a taxi service; we’ll offer you an experience that you won’t forget. To achieve this, we make sure that we’re always dedicated to doing the very best for our customers by tailoring our services to suit. Our services can span everything from a leisurely trip to the nearby town or luxury vehicles that you can hire for a special event. We have vehicles to suit every need, including sleek saloons and practical estate cars that will arrive to you fully valeted both inside and out. We’re a popular choice for executive travel, weddings and airport transfers and we’re proud to say that our services are competitively priced in the areas that we work. Book with us today by calling 01372 722222 or by a clicking here. Got an enquiry? Send an email to info@viceroycars.com, and we’ll get back to you as soon as we can. definitely be using them again in the near future. when I was travelling to the airport last weekend.